I accidentally upgraded my wordpress account and it wreaked havoc. Lost all kinds of posts and it broke countless links. F@$#! One of the many post sent off unanchored into the ethernet was this guest post (and photo) by freelance writer Stephanie Stiavetti. As with her gluten-free fried chicken, enough people have asked about it that I’m reposting it again. I’ve really only recently become aware of what a rotten disease celiac is, especially for people who love to cook, and to eat, and to write about it. This post with Carol Blymire (alineaathome.com) describes the situation, um, vividly (the post also has glutenfreegirl‘s awesome pizza dough recipe). It’s also impressed on me how important it is for chefs to understand celiac disease and gluten-free cooking. Stephanie Stiavetti, a social media consultant and reluctant techie based in the Bay Area, blogs at wasabimon.com. — M.R. In the very beginning of my gluten-free life, I had some dark days indeed. I used to watch everyone else eat their cookies and sandwiches, and in my mind, I just could not reconcile the fact that wheat was suddenly bad for me. It was incredibly difficult to unlearn a lifetime of nutritional education that simply did not apply to me anymore. And how would I survive in the modern world, where nearly everything seems to contain gluten? Oh, woe is me! After a few moths of feeling sorry for myself, I got over it. There’s a whole world of food out there that doesn’t involve gluten, so I got busy rediscovering how to feed myself. Not only did the rules of nutrition change for me, but so had the rules of cooking in general. Everything was different – how I made sauces, soups, and most distinctly, breads. Many years ago, back when I could eat regular wheat-based bread, I remember loving brioche. I’d inhale slice after slice, slathered with with butter, turn it into Thanksgiving stuffing, and slice it up into the most amazing French toast I’ve ever eaten. I was terribly sad to give it up, but that’s what I had to do to stay healthy. Zoë François and Jeff Hertzberg developed this gluten-free brioche recipe for Healthy Bread in Five Minutes a Day, and I’m so excited to have brioche in my baking repertoire again. The first thing I made was a Prosciutto, Havarti and Tomato Panini, and then I went on to make Brioche Cinnamon Rolls and Chocolate Chip Buns. This recipe is so versatile that it can even be used to make Mini Summer Pizzas. For more info about the lovely folks who created this recipe, be sure to check out a short interview with Jeff and Zoë, wherein they share some tips for gluten-free baking. A note on pans and shapes: While this recipe makes a loaf of bread, feel free to turn it into classic brioche shapes if that’s what you prefer. 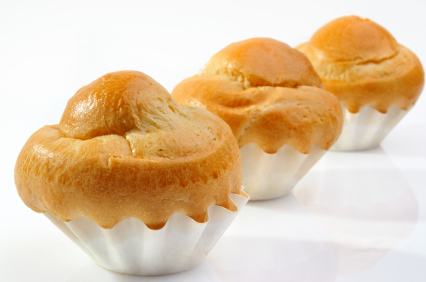 Here are some non-stick brioche moldsavailable online or at your local baking supply store. On baking day, grease a 8.5″x4.5″ nonstick loaf pan. Use wet hands to break a 1.5 pound piece of refrigerated dough and shape it into a ball. Note: the dough isn’t stretched because there’s no gluten in it – just gently press it into shape. You might need to wet your hands to keep the dough from sticking and to create a smooth surface. Do not make the dough soggy. Elongate the dough into an oval and put it in the loaf pan, smoothing the surface with your fingers. Cover loosely and allow to rest for 90 minutes (40 minutes if you are using fresh, unrefrigerated dough). Bake in the center of the oven for about 40-45 minutes. The loaf is done once it is caramel brown and firm to the touch. Smaller or larger loaves will require adjustments in resting and baking times. Remove brioche from the pan and allow it to cool on a rack before slicing and eating. If it will not come out of the pan, let it sit for five minutes to allow the loaf time to steam itself loose from the pan. To firm up the outer crust again, place it back in the oven for three minutes to dry out the damp sides. The discovery of gluten-free products is endless! And they’re not all bad! Sure, most of them are, but if this review is any indication, this brioche should be delicious! Will definitely need to try it. Amazing how many different things this can be!!! Cheers! Being a diabetic, I wish low-sugar/starch/glycemic was ‘in’ the way gluten-free has been lately. Oh boy, I hear you! Many supermarkets in my area (Central Ontario) have whole sections devoted to gluten-free products, whereas items for diabetics are few and far-between. Puzzling, given the news stories about the growing number of people with diabetes. Perhaps we need to make our voices heard. Isn’t this more of a challah? I always thought that brioche had obscene (read: delicious) amounts of butter. Just curious. I would think that the veggie oil be the substitute for butter in this recipe. I have never had normal brioche, so I don’t know how this compares, but it was a very successful loaf with great texture and taste. I used it in a bread pudding recipe, and it was marvelous. These brioche look so tempting, I’m going to have to try this recipe as soon as “baking weather” arrives! Since I don’t get along well with cornstarch, I’ll have to substitute. That will give me an opportunity to apply “Ratio” principles to a recipe presented in volumes rather than weights, AND to substitute ingredients. I also live at high altitude (7,500 feet). It’s not a recipe — it’s an adventure! This is a pretty high startch-to-grain ratio. 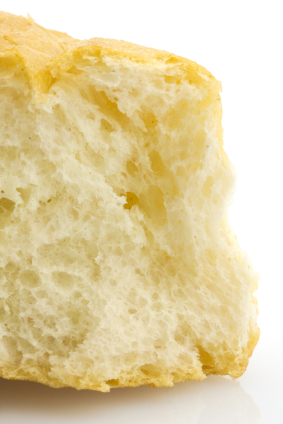 Anyone have a brioche without so much starch? I am a bread baker by profession, and I really don’t see how the above recipe can be called brioche without using quotation marks. Just because you bake something in a brioche tin doesn’t make it brioche. Where is the butter? And the ratio of cornstarch to rice and tapioca flours is weird. Lastly, when working with gluten-free flours it’s imperative to use weight not volume measurements. Slam dukinn like Shaquille O\’Neal, if he wrote informative articles. Our family LOVES this bread and we eat devour it. To all the folks wondering about how it can be called Brioche, ratios, etc…gluten free baking is a totally different world. It defies all rules of baking so for those that care less about ratios/names and more about taste-THANK YOU Jeff and Zoe for your efforts and results!